Well, since I've run out of chickens, I'm back on to the Sassy stem images that Teneale gave me. Watercoloured using my crayons again, and I've done a bit of doodling around the edges to frame the image. 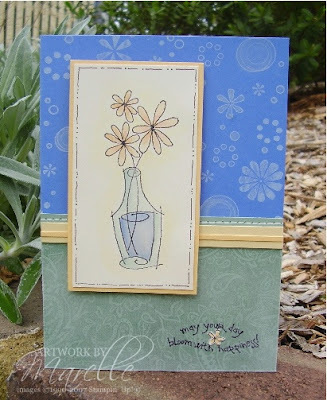 That's the new Petals wheel in the background (it's in our new Mini Catalogue), and just a dash of Paisley too I'm loving the sentiment from the "Blooming with Happiness" set...it seems to make it on to most of my cards lately. The colours here are Ballet Blue, Apricot Appeal, Sage Shadow, and Barely Banana. Beautiful!! I've got this set waiting to be mounted - I think I must do that today! I love what I've seen you do with it! By the way, where are you coming up with your color schemes? They are simply gorgeous, but not ones I'd think up. Is it the Color Coach? Or are you just closing your eyes and reaching for them?! I haven't been to see you for awhile Marelle - I love the chooks!1 your colouring is wonderful. You certainly have a flair for the colours. Now that you have shared your secrects, I hope to colour with confidence! I love this card and everything about it. I think I've got to get Sassy Stems. Great job with the colours once again - I agree with you about the Colour Combo site - very helpful indeed. TFS.